We’re fortunate to have a vibrant arts community in Greensboro, North Carolina, and Mark Wagoner Productions is proud to have had many opportunities to help promote and contribute to its success. One recent project was a video to announce the rebranding of artsGreensboro (formerly the United Arts Council). Mark edited a collage of still images provided by a host of local photographers (including a few of his own), plus music and graphics, into an dynamic statement about creative life in our city. 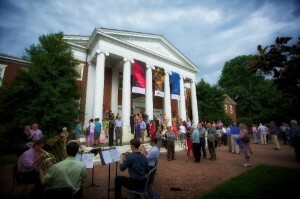 Another notable local arts event is the Eastern Music Festival. Mark has provided still photography and video to help promote EMF for years, and this year he was honored to see three of his images incorporated into the festival banners at Dana Auditorium on the campus of Guilford College.